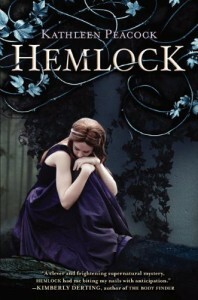 Oh my gosh, it has been a LONG time since I have been obsessing over a book like I am obsessing over Hemlock right now! This book BLEW ME AWAY! I mean, I have read this book about 10 days ago and i am STILL raving about it to anyone who would listen!! Hemlock is definitely one of those rare books that remind you of WHY you love reading so much! Also, this is coming from ME, who is a person that does not like paranormal as much as contemporary and dystopian! However Hemlock was so good that as soon as I finished reading my galley, I went and pre-ordered a copy for myself to reread! Hemlock is about a girl, Mac, who used to be part of a close group that consisted of: herself, Amy, Amy's boyfriend Jason, and Kyle. However this friendship broke down when Amy was found murdered, and all signs point to a werewolf. See, in Hemlock, people know there are werewolves and any person can become one if they contract the Lupine syndrome. However, the werewolves are shunned and when found are sent to werewolf camps where they end up locked there for the rest of their lives. I loved the uniqueness of the story, it really is not like any werewolf novel I've read. Also to add to all this, there is a murder mystery and you all know how much I love those! Every single one of the characters in Hemlock are so damn likable! We've got the protagonist, Mac. 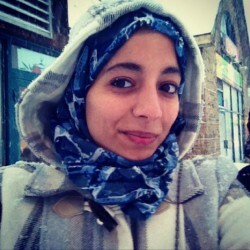 She is strong, level-headed and just an all around GOOD friend to Amy, Jason, and Kyle. She is trying to pick up the pieces of their broken friendship after Amy's death while at the same time trying to solve this mystery (it sort of gave me a Veronica Mars vibe and I love that show!). Then we've got Jason and Kyle. Oh boy, is it possible to love BOTH guys SO MUCH that your heart breaks no matter who Mac ends up with? Jason is the really messed up rich kid that gets in trouble just for the thrill because Amy's death has screwed with his head so much that you just want to hold him and comfort him and tell him it'll be all right. Then we've got Kyle, the best friend you would always want and the secret crush you would always hide. He is the opposite of Jason. He is responsible, is the one looking out for Mac and not the other way around, and YOU want to be held by HIM and hearing him say that everything will be fine. Kathleen Peacock has woven SUCH an amazing romance plot that it has restored my faith in love triangles. The twists and development of the romance and the awkward and charged moments were all so unbelievably AMAZING, it was very hard for me to concentrate on anything BUT the book. Now even though there is a love triangle and romance, the book really centers around Amy's death and mending the broken friendship and trying to figure out what the trackers (think 'werewolf police') are really doing in town while trying to not get killed in the process! Hemlock was such a thrilling, addicting, incredible page turner that I ended up staying way past my bedtime to read it and even reading it in the middle of class because I JUST.COULD.NOT.PUT.IT.DOWN! I am now counting down the days until I can get my hands on Hemlock #2 because that ending? It leaves you with enough closure while at the same time gives you a cliffhanger that leaves you wanting SO MUCH MORE! !